Landstrom's Black Hills Gold Family Pendant is a Black Hills Gold necklace that will display 1 to 5 birthstones to represent different members of the family. Comes with a lifetime guarantee from the leader in Black Hills Gold jewelry, Landstrom's Black Hills Gold. Hand crafted to last a lifetime. 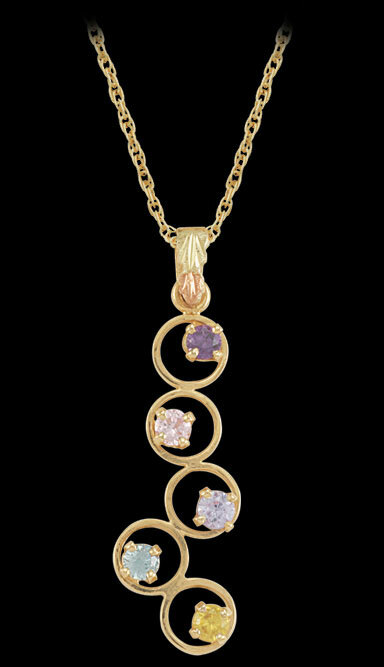 The stones in Landstrom's Black Hills Gold Family Pendant are 3.0 millimeter genuine or synthetic birthstones. 10 karat gold family pendant and 12 karat rose gold and green gold grape leaves. Arrives in an attractive white clamshell gift box. Ships in 10 working days or less. Stone types may not be mixed; please order only with all genuine stones or all synthetic stones. Call us if you need size 10 or larger. Lifetime Guarantee: If there is a defect in materials or manufacturing, your mother's ring will be fixed or replaced by Landstrom's Black Hills Gold free of charge.